Our world’s food supply depends on honey bees. One of every three bites of our food originates from bees pollinating the flowers that produce our fruits, nuts, vegetables and even coffee–coffee production has been found to double when purposely pollinated by honey bees. Each one of us benefits from a healthy honey bee population. Honey bee populations have been declining for decades, (due to colony collapse disorder and other stressors) and they continue to struggle for survival. Honey bees are biological indicators, meaning that honey bee health reflects the general health of the environment. Bee losses are possibly a symptom of a much greater environmental problem. Some organizations and governments have taken steps to try to reverse the trend but it’s not enough. Brian and his beehive at KNOX. Photo by David Cappaert. Did you know KNOX has a bee colony on site? 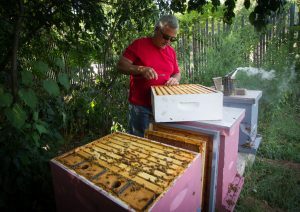 Our farm program has partnered with a local community member who keeps his bees at KNOX to help pollinate our crops and provide Hartford-grown honey to the community. To learn more, contact Chelsea Morrison, KNOX’s Farm & Grounds Manager. 1) Rethink the manicured lawn. Not only is spraying toxic weed-killers bad for the environment, but it also kills bees. Dandelions are a great weed to have on the lawn — the bees will thank you and so will your lawn. 2) Support your local community gardens! The bees loves these places. Community gardens also help to improve air and soil quality, as well as provide the community with fresh food that doesn’t need to be trucked-in. Read more about KNOX’s community gardens. 3)No Spray! Don’t use toxic chemicals designed to kill weeds and pests. If using a toxic (non-organic) weed killer or pesticide, think about how this might fuel the decline of the honey bee population. 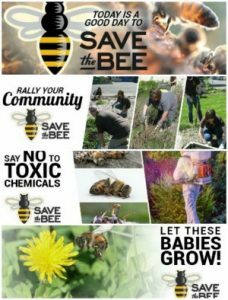 5) Support your local bee keepers! Buy honey locally, it’s cheap, and it cuts down on large companies who manufacture this honey and are not concerned about the treatment of their bees or quality of their honey. Local honey is great for your health, can help improve local allergies and is full of protein-packed bee pollen and enzymes. KNOX has bees on-site during the spring, summer, and fall. Stop by for a visit!